Old style jewellery is very fashionable. Estate jewellery – vintage – antique – period – retro – deco, these are some of the terms that set the mood. How important are such terms when it comes to valuation? Because old-style jewellery is so fashionable, romantic buzzwords abound. Some of the terms are descriptive, others just create emotional appeal. Antique is the most definable. Jewellery that is at least 100 years old may be called antique. Estate jewellery really just means property left in someone’s will. Some jewellers specialize in estate jewellery, recognizing and buying only fine-quality pieces. Certainly not all estate jewellery is valuable (or even old), but occasionally jewellery’s provenance does dramatically heighten its value, as when pieces from the estate of the Duchess of Windsor fetched high prices at Sotheby’s. In the marketplace, however, the term “estate” jewellery is often used merely as a romantic substitute for “previously owned.” It is meant to imply quality. The phrase suggests that the jewellery is old (which isn’t necessarily true), and then plays on the popular notion that old jewellery is valuable by definition. Some jewellers have even been known to take stock that isn’t selling and move it into the “estate jewellery” case to increase sales. Many jewellers avoid the phrase “estate jewellery” altogether and prefer to describe jewellery by its style. 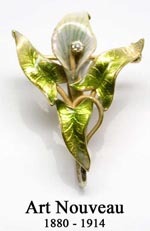 Period jewellery is associated with the aesthetics and design style of a particular period, such as Victorian or Art Nouveau. Jewellery sales often follow trends in popular culture. 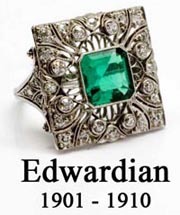 The release of the movie “Titanic” in 1997, for example, has brought about increased interest in Edwardian and Art Deco jewellery. Reproductions of jewellery from other periods are also in great demand. Many are skillfully made, using quality materials, and are sold as reproductions done in the style of a particular period. 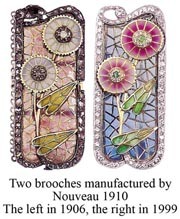 It is important that reproductions be so identified and not passed off as period jewellery. Authenticating antique and period jewellery takes special skill and experience. The jeweller must determine whether a piece is from an earlier period or has simply been made to look old. The appraising jeweller must know what to expect from each historical period—what metals and alloys were available or commonly used, what shapes were popular for stones and how the stone-cutting was done. Every period has its personality, and the jeweller must be familiar with subtle details and nuances of style. He must know the importance of a particular provenance and be able to distinguish an authentic signature from a fake one. Buyers — jewellers as well as individual purchasers — must always be wary. One jeweller pointed out that auction catalogues from 50 years ago would say a piece of jewellery was “by Tiffany” or “by Cartier.” Now the catalogues say “signed Tiffany” or “signed Cartier,” indicating that a signature is present but the auction house isn’t necessarily saying the piece is genuine. Copies and imitations of period jewellery are being made in centres all over the world. Some are of high quality and workmanship, advertised and sold as reproductions. However, after a year or two on the market, such pieces may no longer be identified as reproductions but be passed off as genuine period jewellery. The number of out-and-out fakes is at an all-time high. Technological advances allow treating stones and imitating metal patinas as never before. Scammers even use auction catalogues to find models of jewellery to copy. Further muddying the waters are altered pieces and the so-called “put-together” pieces. An old brooch may have some new stones. A long necklace may have been shortened for a more fashionable look. Even replacement of a clasp can ruin the authenticity of a fine piece and lower its value. Many people assume that old jewellery is by definition valuable. This is not necessarily the case. A piece may have no redeeming qualities except that it has lasted for 150 years. The value of a piece of jewellery depends upon the intrinsic value of the materials, the quality of the craftsmanship, and the market’s demand. In jewellery, as of other things, styles go in and out of fashion. Even a good quality piece can lose value if its style is no longer considered appealing — that is, if the jewellery is not saleable. Accurate valuation of period jewellery can be made only by a jeweller/ appraiser who regularly handles such jewellery, who knows the market for such pieces, and who can recognize alterations, reproductions and fakes. Even experts often depend on independent grading from major labs when purchasing estate jewellery. Beware of important-sounding words on an appraisal that say nothing about quality. “Antique” only means the piece is at least 100 years old. Do not take it to mean unique or valuable. Terms like “Victorian,” “Edwardian,” “Art Deco,” etc., describe the style of a period. They say nothing about value. A contemporary piece in the style of an earlier period should be so described, so it is not confused with jewellery made during that period. Authenticating and valuing antique and period jewellery requires skill and experience. Be sure the appraiser is one who is familiar with the pricing in this specialized market and alert to its scams, such as one who is a member of the Jewellery Appraisers Society of New Zealand and whose appraisal carries the JASNZ logo. Be sure the appraisal includes a picture of the jewellery. This can be invaluable in the event of a loss. A sales receipt is also very useful.